Our Tripod stand design offers the best of all the worlds - versatile, stable, and beautiful. Key features include chromed tripod base with Aluminum powder coated top in the colour of your choice, with adaptable dials for height and base adjustment. Our most attractive and technically advanced stand, popular with individual performers! 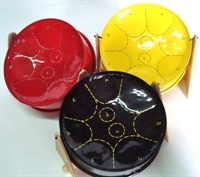 Customizable, highly stable and flexible, this chromed stand with powdercoated top is a preferred choice of musicians of the Tenor Pan. 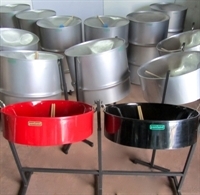 Suitable for the High Tenor and Low Tenor instruments. Stand bag is included.